Those who have not seen the trailer, check out the video below. Dr. Ryan Stone is a Mission Specialist who is a very brilliant medical engineer and is on her very first shuttle mission to attach a high-tech new scanning device to the Hubble telescope on the Space Shuttle Explorer after going through a six months special Nasa training. Accompanied by veteran astronaut Matt Kowalski, who is commanding his final expedition. During their spacewalk to service the Hubble Space Telescope they get info from Mission Control that a Russian missile was used to strike a satellite and that it has caused a continuous chain reaction of cloud space debris. Of-course Mission control orders that the mission be aborted, the shuttle gets destroyed by debris. Dr. Stone gets detached from the shuttle and starts to wander further into space. She starts to panic, making her use up more oxygen in her tank. Very soon Kowalsky finds her and they make their way back to the space shuttle, now Dr. Stone and Kowalsky are completely alone and they are tethered to nothing but each other. They have lost contact with Earth and with it any chance for a rescue mission. Still the astronauts continue to transmit, hoping that the Mission Control can still hear them. Their only way home is to go further out into the terrifying space and reach the Chinese shuttle and use their escape pod to reach home.. The majority part of the film is about just two astronauts now would think it will be a drab but it has been done extremely well..
Something else I liked was even though it is a space movie it's not a si-fi nor future kind of plot.. The main story is sooo simple, what will happen to a first time astronaut when they get detached from the space craft and end up being the only survivor.. 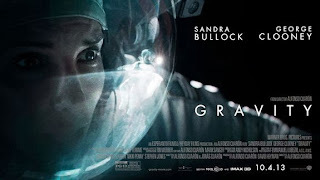 Extraordinary visuals making it seem so life like..
Must watch movie for anyone who loves or does not love space, time just flew by seeing this movie..
How do you rate the movie?.. Share your views..
Disclaimer: I am not being paid to do this post.. Any reviews/thoughts/etc about it is my own opinion.. I am in no way affiliated with this establishment..
P.S. I am hosting a giveaway with some amazing prizes (including movie DVD's) on my blog http://munniofalltrades.blogspot.in/2013/11/a-fantabulously-fantastic-giveaway.html. Hope you participate!